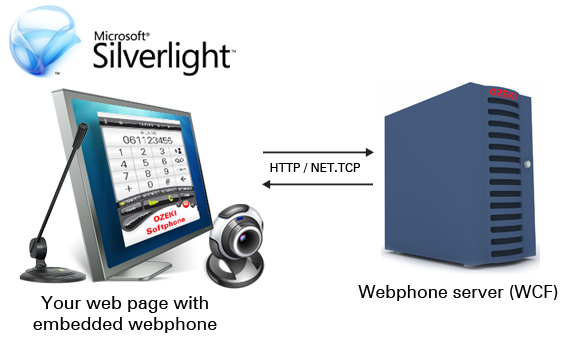 This article is a detailed guide about Silverlight webphone client-side technology provided by Ozeki VoIP SIP SDK. After reading through this page you will be fully familiar with all the essential terms concerning Silverlight technology in webphone solutions and what you will need for creating your own solution using Ozeki VoIP SIP SDK. Microsoft Silverlight is a multimedia tool for displaying media streams mainly embedded in web pages. It has its own method set and can be programmed from Visual Studio. Silverlight is defined for multimedia display, therefore it has its own camera and microphone handler methods (Figure 1). The basic problem with Silverlight peripheral handling is that it needs a direct user interaction to allow the reach of the microphone or the web cam. The program code, you can download from this page uses the background support of Ozeki VoIP SIP SDK, therefore you will need to download and install the SDK on your computer before starting to use the program code. You will also need to have Visual Studio 2010 or compatible IDE and .NET Framework installed on your system, as the program code below is written in C# language. Figure 2 shows a basic .html site with a company logo and a Silverlight webphone placed on it. For the example .html page, the style definitions are made inline, but you can also use them in a .css file. The Silverlight display style is defined using the following settings seen in Code 1. You also need to place your Silverlight object on the site. Code 3 shows the .html code for this purpose. You can place it anywhere on your page and the webphone will be instantly usable when two clients are connected to the server. The example program you can download from this page only supports web to web voice calls, but the website integration is the same for any Silverlight clients too.